Imagine if the air that we breathe were privatized. Companies would allocate it for payment and profit, and, one would hope, throw in a bit of quality control. A completely crazy idea, of course, but it puts into perspective just how much of what we consider public goods or the commons has already been carved up. In many parts of the world, even water – the next of life’s essentials – is already in private hands. No-one grows or makes it, yet corporations are allowed to control it. For over four decades the mantra of ‘private good, public bad’ repeated by global financial institutions and proponents of small (read ‘corporate’) government has fed the fiction that the private sector is better, more efficient at almost anything. The notion barely registers that private profits made from public goods and services deplete the commons even further. Despite flop after expensive flop requiring public bailout and tales of corporate corruption that match anything levelled at state bureaucracies, the drive to privatize is still in full vroom. Except, now counter currents are also flowing. 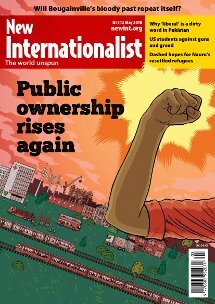 Often at the city and citizen level, there is an upsurge of public ownership, showing that it can be done and done better in the common interest. This edition’s Big Story celebrates this highly significant shift, while not glossing over the difficulties posed by the hostile climate in which it is occurring. In our other features, we travel to the island of Bougainville for a classic tale of the resource curse. After a history of strife related to mining, followed by a hard-fought victory for eco-rebels, the possible exploitation of the island’s fabulous mineral wealth is stirring up old tensions.